Workout routines such as Pilates have more in common with sailing than you may initially think. Both must be designed with components that are load rated for maximum performance and easy for the end user to operate smoothly. The ropes used in pilates have to be especially durable in order to withstand repetitive motions and frequent use. 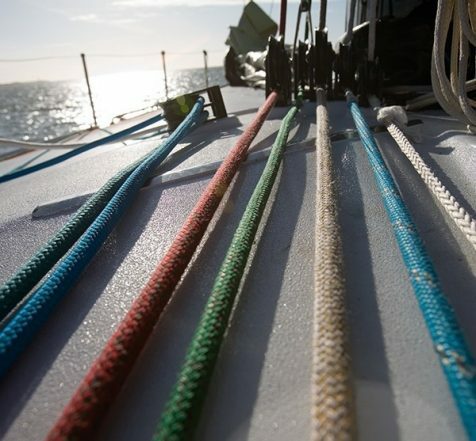 Products manufactured for both the sailing and exercise industries are designed for longevity, and longevity depends largely on the materials of the rope itself. Some ropes will fray or break under the strain of being repeatedly pulled and eased. Polyester braids and high-wear technora lines hold up the best under loads in these conditions. The ideal solution is a high-tech load-bearing core protected by a woven cover, such as the ropes produced by Dyneema. Dyneema Ocean 5000 rope is pre-stretched, meaning that it won’t loosen even with the most rigorous and repetitive of uses. It is also heat set, helping it provide a huge increase in breaking strength even in extreme circumstances. Dyneema Ocean 3000 rope combines high strength with minimal creep. It also features a UV coating for stability and enhanced abrasion resistance. This version of Dyneema rope has an excellent strength to weight ratio and is available in three colors—grey, red, and blue. These features, in particular, make the Dyneema Ocean 3000 a popular choice in commercial gym equipment where aesthetic and convenience are important considerations. If you have any questions about Dyneema rope, contact us online or call 401 293 0539.